It has been a while since I updated this blog. I have not been going hashing with the geeks for a long time now. The main reason is that I have been concentrating on BikeTrial and training a lot. Learning is slow and requires a lot of focus... LOL. Most of my blog updates are focused on BikeTrials and I keep track of my progress at the other blog... Heheh. 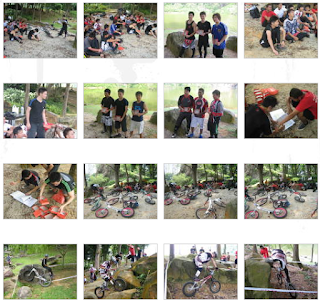 Anyway, recently I went to Singapore for a BikeTrial competition and here is a brief report. The Round 3 of the Singapore 2009 National BikeTrial Championship was held in Bukit Batok Town Park on Oct 4th. I was there to capture the event on photos and videos. For this round, a couple of things stand out and affected the overall competition; the format and the sections layout. Results and Full report on BikeTrials and a Fistful of Blisters.